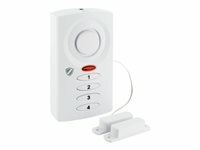 This SCHWAIGER garage & sliding door alarm is used to secure garages or doors such as sliding doors. As soon as the garage or door is opened by an unauthorized person, an alarm sounds in order to discourage intruders. For this reason, this product is perfect for installation on houses, garages or e.g. tool sheds. The alarm is activated / deactivated by entering a 4-digit PIN code.